Moodle is the LMS I am most familiar with, so I will use the examples from it. The online environment gives us a chance as instructors to move the quiz assessment feature to new levels for student formative and summative assessment. It allows us to use video, audio and images to help with better assessment but also with helping students learn better. Whether it’s a graph in shown so students can answer questions, or multiple choice questions where the questions and/or answers are “read” to students with audio files, there is a lot of untapped potential. In the last few iterations of Moodle more and more question answers are now text editing windows instead of just text entry windows. With the full toolbar, videos can be imbedded and audio files added with the insert media tool. Image can also be inserted. The PowerPoint slide below shows the use of audio files in the question part of the matching question on the left. Song clips can be uploaded using the insert media icon on the editing toolbar. The names of the songs are in the answer portion. This question type doesn’t have the editing toolbar on the answer portion. This is a musical application but the same thing can be done with other kinds of audio, such as reading instructions to students, giving them something to think about before writing an essay and more. That would be especially useful to beginning readers or students just learning the language. It can also help to separate the auditory language knowledge from the written language knowledge. Not always an easy thing to test. 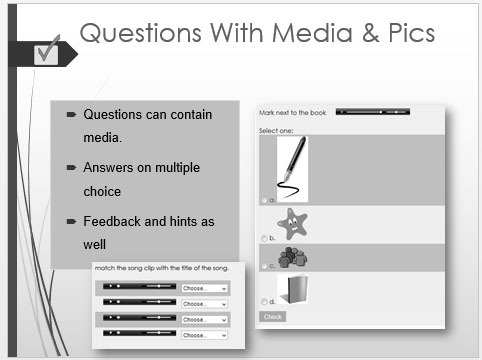 The example on the right in the slide above, shows pictures in the answers and an audio link in the question that will read the question to students in a multiple choice question. The images were all given the same width using the appearance tab in the insert/edit image window to give them something close to the same size. Media can also be added to the response template in essay questions as well as the question itself. Another idea is when using the quiz as a formative assessment/learning tool for students, turning on the adaptive mode in the quiz setting will allow the use of hints on some of the questions. The hints windows in the question set up is a full editing window so some explanations that would help the student better understand the question can be added. Space is a limiting factor here, so a link out to a video or diagram or other resources might be helpful to the student. To keep the student from exiting the quiz, set the Target to “open in a new window” to bring up a window which can be closed after viewing. I hope these ideas will get you started thinking about ways to use a quiz which might expand your use the capabilities of online quizzes. ← Have you experimented with the Moodle Glossary activity?